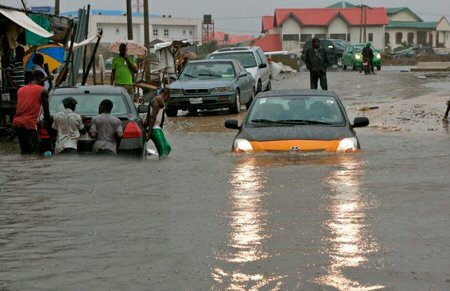 Another flood has ravaged some FCT communities including Kuruduma and Kobi, killing 3 persons and sweeping away houses. The flood, which followed the heavy downpour that started around 1 p.m. on Monday, inflicted pains and sorrow on residents of the communities who lived along the water channels. Addressing newsmen at Kurudu community on Tuesday in Abuja, a witness, Ezekiel Kacha, said that two children were swept away in Kuruduma community. Kacha said that a young man in his late 20s and one Uche were carried away by the flood when they were struggling to save properties at Kobi village. One of the victims who preferred anonymity, narated how Uche struggled for survival but was overpowered by the flood. He also said he escaped death by the whisker, because his own house was already flooded, adding that he was rescued by good spirited youths who braved the flood. The source further explained that the youths came through the back of the house, broke the Windows to pull him out. The Nation reports that another victim, Sarah Zakka who was struggling to scoop water out of her medicine store, said the flood took them unaware, but, however, expressed gratitude that she survived it. According to her, her poultry was completely washed away with all the birds, goats and pigs. Confirming the incident, the FCT Emergency Management Agency ( FEMA) spokesperson, Emeka Iwuagwu, said that the agency had recovered one corpse after several hours of search through the water channels. Iwuagwu also added that about three persons were rescued alive, immediately they received distressed calls and rushed to the communities.